We passed inspection by the county this morning, but the weather has turned too bad to pour concrete tomorrow, so we are postponing until after Wednesday's storm has passed, and will resume work on Friday. Today the electrician finished his work on the pipe that carries the power, and the Tuffshed foreman Mike visited to inspect the site and check and adjust the position of the hold-down bolts that are set into the foundation. 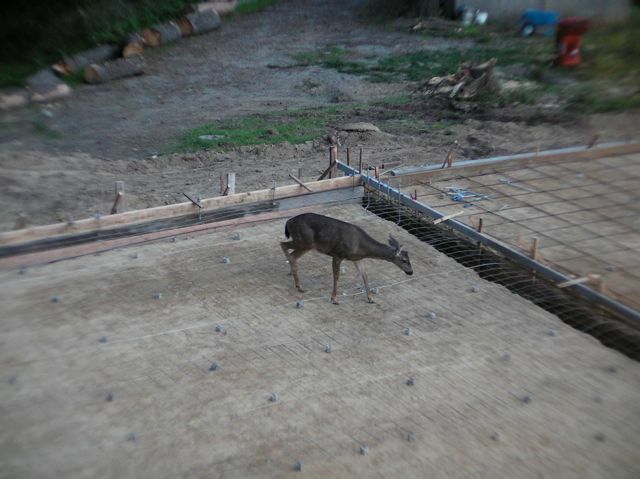 The concrete team were back today, putting in more rebar and tidying everything up. Chris Ramoutar the Electrician was also here putting in a 2-inch pipe to carry power to the garage. I'm having a high spec 220V and 200Amps dedicated circuit configured so that it's ready to recharge electric cars in the future. I got a work-out clearing up the felled fir tree and chipping the small branches, and collecting large rocks that had been dug up, and arranging them around the pond. Here's a view from the deck, you can see the apron on the right, and the garage foundation on the left, and Chris working in the trench that takes the power line. 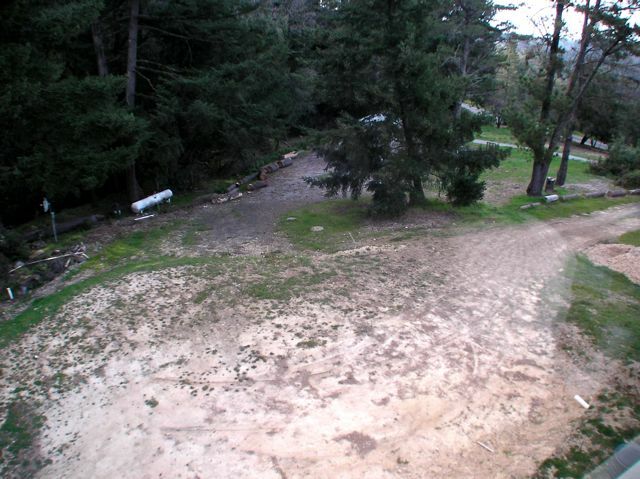 Here's a view from where the driveway will be as it joins the apron, you can see the walkway to the left of the garage. Later that evening some very confused deer wandered over the foundations, since it has been built over their usual path from the forest out to the front yard. Another stop motion video at 30s intervals shows most of the day's work. The tree that was falling over was pushed back the other way and cut up, and they added the parking "apron" in front of the garage. 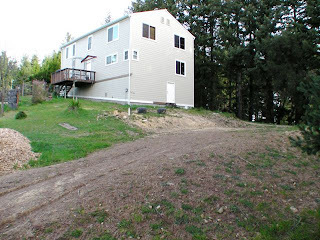 There is a 4ft wide walkway along the side of the garage by the house, so the main pad is 36 by 36ft. It slopes to the right by three inches over that width so it will drain. The walkway slopes away from the garage by one inch. The apron is 26ft deep, 36ft wide and slopes by 12 inches (4%). The driveway will connect to the side of the apron that is nearest the house. Today the new leach-field pipe was inspected, and the foundations were dug, I did a stop-motion video using iStopMotion on an old MacOS laptop looking down from the house, and most of the day's work is compressed into one minute. 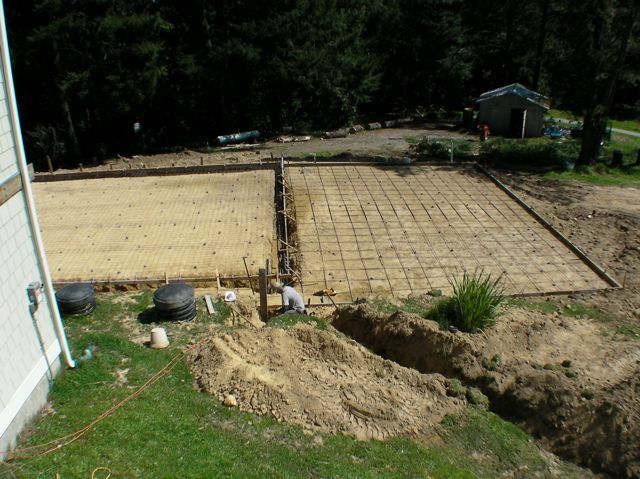 Tomorrow they will do the detailed preparations for the pour on Monday of the garage slab itself (6" thick), perimeter foundation (at least 18" deep, more on the downhill side where it is on in-fill), a walkway down the side of the garage, an "apron" in front of the garage to park on, and pads for the propane tank and generator. In the first picture, taken from a window in the house, the white blob is the propane tank, and you can see the leaning tree. The second picture is looking back from by the tree. The two low black things by the house are the caps for the septic tank. I'm setting up a stop motion camera, will try to capture the building process. The MacOS iStopMotion app seems to work fine and has a five day free trial, so we will see how that goes. I went into the county office and picked up the permit, paid them some more money to cover their costs of inspecting the work as we do it. They gave me back one of the marked up copies of the final site and building plans, and the permit sheet, and I stopped off at a Fedex office to get several copies made. Next stop is Tuffshed, to talk to the foreman who gets it built, and the concrete contractor (Jose Amaya Concrete of Morgan Hill) who normally works with Tuffshed. Jose is available immediately so we may actually get going fairly quickly. 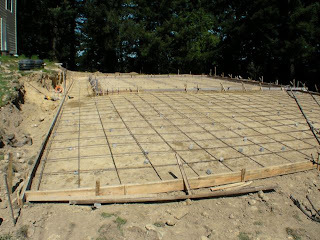 First step is to mark out the foundation and pour it. The new septic tank connection pipe is going in today and being inspected tomorrow. The county turned around the final update immediately and I got a letter in the mail today! Now I just need to visit them to get the actual permit document. Spring is here, and we just had a few clear days, shown below. The sunrise and sunset are about 12 hours apart. We installed the system just before the fall equinox, so we now have a good calibration of the output levels through the least sunny part of the year, from now on it will be interesting to track the output as we go to the longest day. Actual average output over the last 200 or so days is about 14.3 KWh/day. Yesterday was 22.5 KWh, and at the winter solstice low point it was 16 KWh on a clear day as previously blogged. This morning I took the requested clarifications on the building design into the county offices. We should hear back in a week or two, it's minor stuff so I hope this is the last step. We already have our permit for the leach field repair, so I'm starting on that work. We got the septic tank pumped and inspected (it was in good condition) this week, and filed the inspection results with the county, so the next step is to put in a new re-routed pipe and diversion valve between the tank and the leach field. 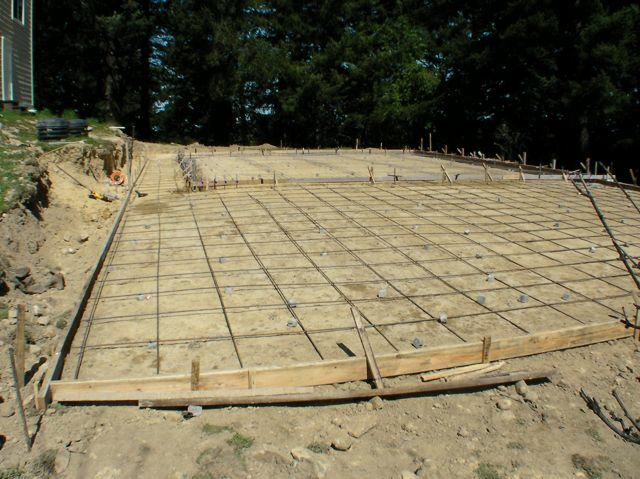 To get everything approved we had to survey the land and get a detailed plan drawn up by a Civil Engineer - we used Terry Szewczyk and he was helpful, competent and kept the costs to a minimum. 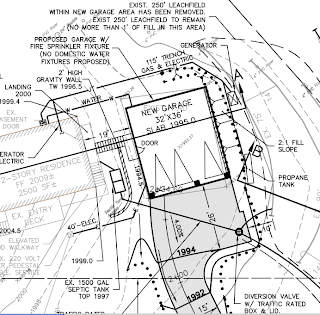 The picture below is a detail from one of the drawings, which were produced at 1inch to 20ft scale, and shows the important part where the garage goes. For some reason the contour lines altitude is shown based around 2000ft, whereas the real altitude is about 2400ft, but no-one seems to care if that aspect of it is accurate. Our first step is to replace the pipe that goes from the septic tank to the diversion valve and the remaining leach field, so we start by getting the tank emptied (which needs to be done every few years anyway). The pipe has to dive down a bit then go across under the concrete "apron" that will lead up to the garage, and it won't be buried very deep, so we will be putting down a 4" pipe that is placed inside a 6" pipe for the part that goes under the driveway, to give it extra protection from being crushed. The final detailed changes we need on the building design plan are now in hand (the layout plan shown above is already approved), so I'm back to the county office again next week to resubmit them and hopefully get the permit. The other details you can see on the plan are the electrical connection, which will be a 220V -200Amp dedicated circuit capable of charging electric cars one day. The propane tank will be relocated, and hooked up to a generator and the house. There is also a water connection to a fire sprinkler system. My five year old wifi hardware got flaky and slow, so I looked around and decided to go with the D-Link DIR-825 as my central node and a DAP-1522 to bridge to my TV etc. They are both N spec dual frequency systems. Arrived today from Amazon for $225 for the pair. [Update: they are working fine, I have a 130Mbit/s link speed reported on the 5GHz link between the DIR-825 and the DAP-1522, and I've shut down all the old WiFi networks].